The global laboratory accessories market is expected to reach $504.7 million by 2020 from $327.0 million in 2014, at a CAGR of 7.5% from 2014 to 2020. The demand for lab automation is expected to increase in the coming years as researchers and scientists prefer using these systems to enhance the efficiency of drug discovery, high-throughput screening, liquid handling, and purification and polymerase chain reactions. However, automation not being a priority for small- and medium-sized laboratories and lack of planning for technology development are factors restraining the growth of this market. The high growth of the market can be attributed to the availability of funding for research, higher reproducibility and accuracy of laboratory accessories, large-scale disease outbreaks, and increasing adoption of laboratory automation in drug discovery and clinical diagnostics. North America dominated this market owing to the implementation of the Affordable Care Act and NIH’s Big Data to Knowledge initiative. On the other hand, the Asian market is growing at the fastest rate due to significant focus on the biotechnology industries in China, South Korea, and Singapore and the increasing number of hospitals in this region. The report categorizes the lab accessories market on the basis of products, end users, and regions. On the basis of products, the market is segmented into microplates, label printers, pipettes, pumps, reagent reservoirs, valves, tubings, and wash stations. Based on end users, the market is categorized into original equipment manufacturers (OEMs), biotechnology and pharmaceutical companies, hospital and private laboratories, academic institutes, and research institutes. Based on regions, the market is categorized into North America, Europe, Asia, and the Rest of the World. 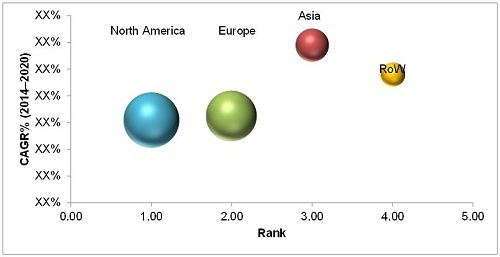 North America is the largest market, followed by Europe and Asia. However, the Asian market is slated to grow at the highest rate over the next six years. The major players in the laboratory accessories market include Roche Holding AG (Switzerland), Abbott Laboratories, Inc. (U.S.), Tecan Group Ltd. (Switzerland), Thermo Fisher Scientific, Inc. (U.S.), Beckton, Dickinson and Company (U.S.), Greiner Bio-One GmbH (Austria), Bio-Rad Laboratories, Inc.(U.S.) Hamilton Company (U.S.), Analytik Jena AG (Germany), Brooks Automation, Inc. (U.S.), and Corning Incorporated (U.S.). This report categorizes the global laboratory accessories market on the basis of products, end users, and regions. Based on products, the market is segmented into microplates, label printers, pipettes, pumps, reagent reservoirs, valves, tubings, and wash stations. The microplates segment includes microplate accessories such as microplate storage racks, well orienters, and well stands. The wash stations segment accounted for the largest share of the global laboratory accessories market, followed by syringes and syringe pumps and microplates segments. The large share of this segment can be attributed to the high cost of wash stations as compared to the other components used in laboratory automation. The reagent reservoirs segment is expected to grow at the highest CAGR of 12.8% from 2014 to 2020. This report covers the definition, description, and forecast of the global laboratory accessories market in terms of products, end users, and regions. The global laboratory accessories market is expected to reach $504.7 million by 2020 from $327.0 million in 2014, at a CAGR of 7.5% during the forecast period. The market is dominated by North America, followed by Europe, Asia, and the Rest of the World (RoW). The large share of the North American market can be attributed to the implantation of the Affordable Care Act and NIH’s Big Data to Knowledge initiative. However, the Asian market is expected to witness the highest growth rate in this market owing to the significant focus on the biotechnology sector by the governments of China, South Korea, and Singapore and the increasing number of hospitals in the Asian region. Some of the prominent players in the global market include Roche Holding AG (Switzerland), Abbott Laboratories, Inc. (U.S.), Tecan Group Ltd. (Switzerland), Thermo Fisher Scientific, Inc. (U.S.), Beckton, Dickinson and Company (U.S.), Greiner Bio-One GmbH (Austria), Bio-Rad Laboratories, Inc. (U.S.) Hamilton Company (U.S.), Analytik Jena AG (Germany), Brooks Automation, Inc. (U.S.), and Corning Incorporated (U.S.). 10.1 Thermo Fisher Scientific, Inc.